13-Apr-2003 -- This is our first confluence. Several weeks ago, I heard about the DCP. The idea looked gread and now we are here. This point located in a swampy forest 500 meters away from the road between Vinzeli and Mulashi vilages. 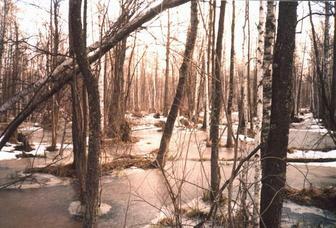 It was impossible to get closer, because there were swamps all around covered with slightly melted ice. As I mentioned this is our first confluence, but definitely not our last. Thus the confluence hunt begins.